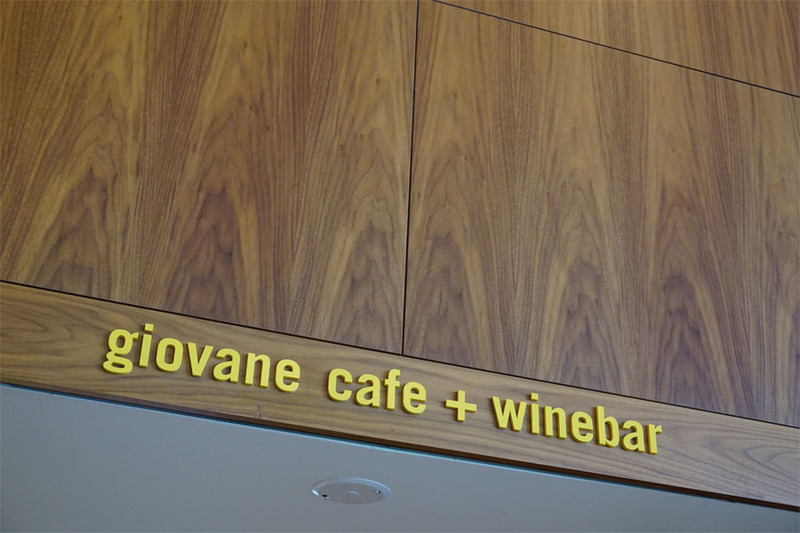 Located inside the Fairmont Pacific Rim Hotel in Vancouver, Giovane is a cafe/bakery/wine bar/gourmet market that opened in 2010 along with the hotel. 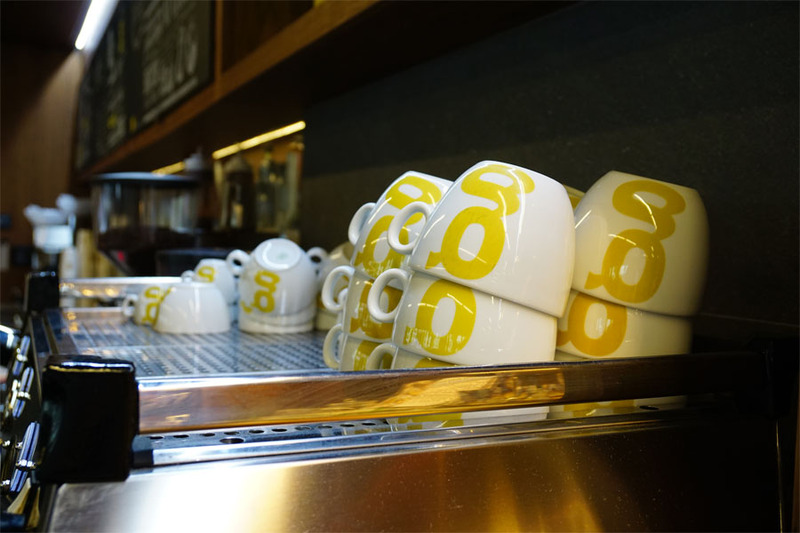 They recently made the switch to using Portland's Stumptown Coffee Roasters which will is also now being served upstairs at the hotel's restaurant ORU. After a brief absence from the Vancouver in 2013, there are now four cafes around Vancouver serving up Stumptown including Giovane. You'll find Stumptown's Hair Blender Espresso blend for their espresso drinks prepared on their La Marzocco GB/5 along with a few filter brewed coffee using a Fetco coffee brewer. The cafe is also planning on serving Stumptown's cold brew coffee on tap fairly soon, but until then they are stocking the Stumptown cold brew stubbies. The cafe space was designed by MGB Architecture + Design (split into two new firms in 2012) which also designed ORU. The space features a 68-foot long custom millwork wall made of walnut veneer that also continues onto the ceiling. In the summer, Giovane can also quickly transform into a quasi sidewalk cafe with most of the windows in the space dropping down opening the cafe to the street. MGB also created the branding for Giovane which was inspired by the Milan-based 10 Corso Como restaurant/retailer along with Italian artist and designer Enzo Mari. You can also find some of the hotel's art collection in the cafe with a selection of prints from Vancouver street photographer Fred Herzog from the 1950s and 1960s on display. The exterior wall above the cafe features a 9,500 square feet screen that was designed by building architect James Cheng. The stainless steel screen when viewed in the right light shows the trunks from an abstract forest created using a photograph of a North Vancouver forest. 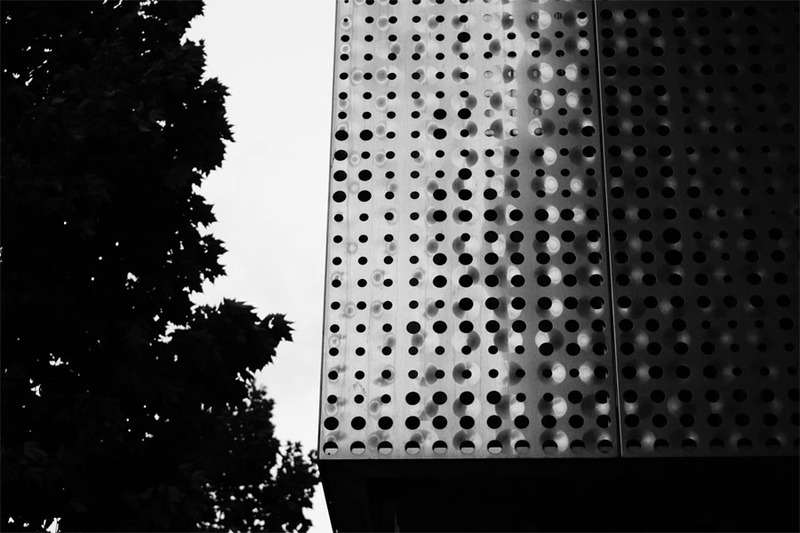 It contains 166,333 circles punched into the metal along with 75,385 bumps and dimples (the recommended viewing spot is across from the Shaw Tower building on the south side of Cordova Street). There are two slits in the screen on the south-facing wall with one providing access to ventilation exhausts while the second is for windows in the hotel's banquet kitchen. Some other notable public art in the building includes the 180-foot long origami light fixture in ORU created by Vancouver origami artist Joseph Wu and Liam Gillick's Letters Wrapped Around the Building with the text "Lying on top of a building the clouds looked no nearer than when I was lying on the street" wrapped around part of the building. 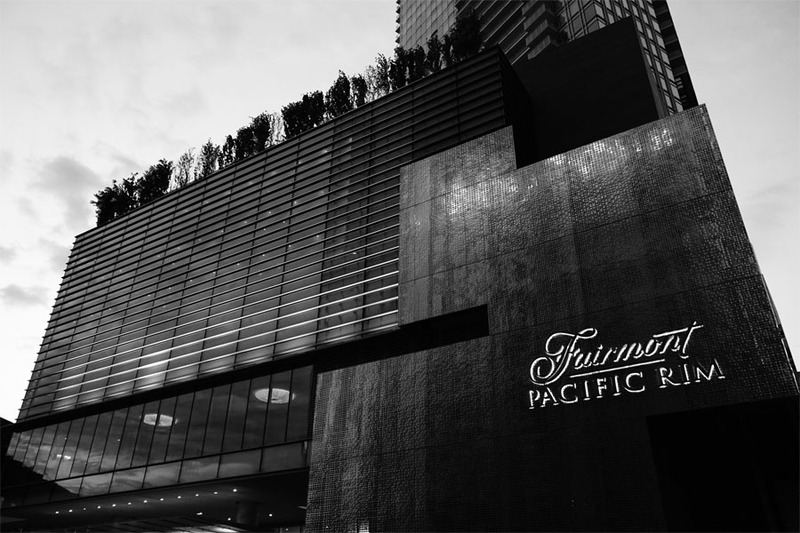 A large black and white print of the photograph used to create the Abstract Forest metal screen is located by the staircase between the 2nd and 3rd floors off of the hotel lobby. "Cheng's real breakthrough is found at the lower levels of the 21-storey hotel portion, where ballrooms and kitchens provide him the rare opportunity to fashion walls which are not floor-to-ceiling glass. (Vancouver's grey and temperate climate means that entirely glazed condo elevations are possible, usually without air conditioning.)" "While most top-flight hotels have formal lunch and dinner service down to a fine art, quick coffee and sandwich sales are usually seceded to the local Starbucks. 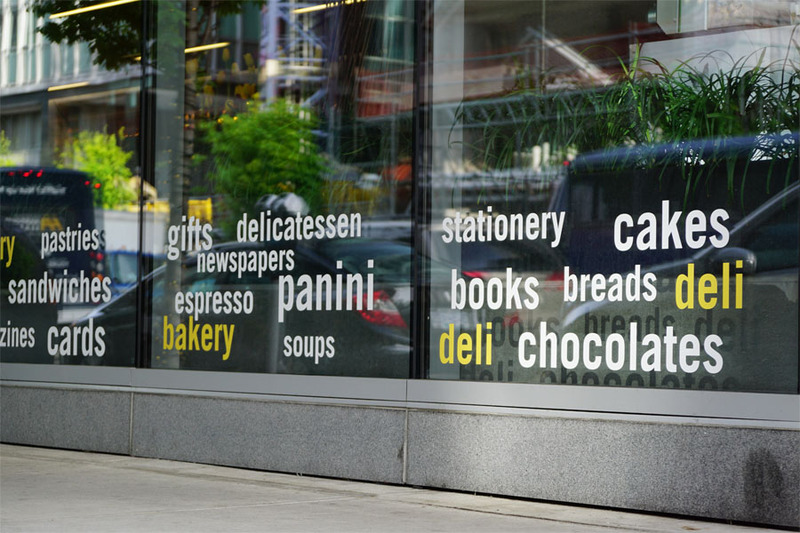 Not so for Giovane at Vancouver’s Fairmont Pacific Rim, a trendy café and bakery concept." "I hope to be able to come back to the project five years later and feel that the space is still current, thoughtful and beautiful."